This is a truly unique experience in Central Oregon as the entire restaurant is closed to the public. Both servers and the kitchen team donate their time and chefs and executive team members are brought in to help coordinate this wonderful evening. 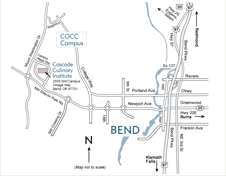 The COCC Foundation and Anthony’s HomePort Restaurant presented the first annual Feast at the Old Mill in June of 2005 and the event has now raised more than $200,000 in total for the Cascade Culinary Institute.